$1,000,000 has been allocated to improve the visitor experience at the Twelve Apostles in the short term. The Twelve Apostles Visitor Centre is a major tourist attraction for Victoria, currently attracting up to 10,000 visitors a day, with 14,000 per day predicted by 2034. Stage 1 of landscaping works in the car park have been completed. Rust treatment and painting of the visitor facility has also been completed along with plumbing works and floor retiling in the male toilets and improvements to barriers at Castle Rock lookout. Planning is underway to identify other projects and improvement works. It is anticipated that improvement works will continue to mid-2017. Installation of Wi-Fi infrastructure at the Twelve Apostles will enable digital Interpretation, through a combination of mobile applications technology or beacons/ sensors placed throughout the site. Parks Victoria has started scoping for this project. Further details will be provided as it moves into planning stage. Castle Rock provides a great view for visitors to the Twelve Apostles. The Victorian Government is investing $2.4 million to build a new lookout structure at 'The Saddle'. This will replace the existing 'bunker' lookout at Castle Rock. The proposed improved visitor infrastructure will improve the view and provide a safer visitor experience. Perched on the limestone saddle, this new lookout will provide an unforgettable visitor experience by unveiling a spectacular view of the iconic Twelve Apostles. The Saddle Lookout is two long rectangular black and white blocks with one resting on the saddle and the other cantilevered towards the ocean. The view is hidden when visitors enter and, as they continue through the lookout, the unrivalled views of the coastline are revealed. 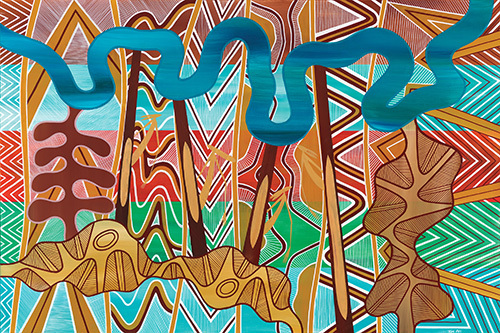 The design has been informed by engagement with the Eastern Maar Aboriginal community. The siting, forms and expression is a contemporary reflection of cultural heritage, while delivering a memorable and engaging visitor experience. The new lookout will be complemented by an additional walking track with rest stops creating a one-way circuit loop. This introduces a new, more protected and intimate experience, focussing on vegetation and cultural heritage. To construct the new Saddle Lookout, the Castle Rock Lookout will be removed and revegetated. Preliminary geotechnical, environmental risk and cultural heritage assessments have been completed. Geotech investigations involving geophysical (seismic) testing and drilling of boreholes occurred to further understand the ground conditions at the Saddle. Aerial scanning using drone mounted scanners was also undertaken to assess rates of cliff recession. The findings from these investigations have informed the location for the new lookout. The flora and fauna site surveys revealed there are important species including the coastal Tussock Grassland, Southern Brown Bandicoot, Swamp Antechinus, Broad Tooth Rat, Rufus Bristle Bird and the White-footed Dunnart. Appropriate measures will be taken to ensure minimal impacts occur to these species and their habitats through the construction and operation of the new lookout. The Eastern Maar are the Traditional Owners for this area and this is a place of cultural significance and importance. The Eastern Maar will continue to be engaged as partners for the project as it develops. A Cultural Heritage Management Plan has been completed and it identifies the cultural heritage within the project area to be protected during construction and operation. The Loch Ard Precinct is a large, diverse landscape and coastal environment with multiple destinations and features of visitor interest. The Victorian Government is investing $1.2 million to build The Blowhole Lookout which will provide a new visitor experience at this tucked away site nestled amongst native vegetation. The new lookout design respects the environmental and cultural characteristic of the site. It is subsumed in to the landscape and curves around the edge of the blowhole without impeding the symbolic breathing of the whale. Improved access tracks curate the approach by concealing and revealing views so visitors experience the blowhole and native vegetation from a range of locations. The former Blowhole Lookout was removed several years ago due to potential visitor risks posed by natural erosion of the limestone rock. Geotech investigations involved geophysical (seismic) testing, drilling of boreholes and aerial scanning was conducted using drone mounted scanners to assess rates of cliff recession. The findings from these investigations have directly informed the location of the lookout, its design and the supporting walking paths. The flora and fauna site surveys revealed there are important species including the Coast Headland Scrub, Southern Brown Bandicoot, Swamp Antechinus, Broad Tooth Rat, Rufus Bristle Bird and the White-footed Dunnart. Appropriate measures will be undertaken to ensure minimal impacts occur to these species and their habitats through the construction and operation of the new lookout. Partnership with the Traditional Owners, Eastern Maar, is ongoing to support the design, particularly the cultural interpretation strategy. A Cultural Heritage Management Plan is currently being finalised. It identifies the cultural heritage within the project area to be protected during construction and operation. The Victorian Government is investing $3.2 million in Port Campbell to rebuild a pedestrian bridge over the local creek and into the adjoining Port Campbell National Park. The new suspension bridge will provide a walking connection over Port Campbell Creek. It is designed to have minimal visual and physical impact to maximise uninterrupted views along the creek. The bridge will facilitate a year-round connection from Port Campbell to the Discovery Trail and Port Campbell National Park. The creek flow to the ocean fluctuates and at different times of the year it inhibits safe access between the township and the Discovery Trail. The bridge will provide important pedestrian connectivity. The design will respect flood and storm surge mapping and environmental conditions from the Corangamite Catchment Management Authority. Feasibility assessment occurred on three locations and connection options for the bridge. A site analysis was conducted, bringing together all site visits and known information about the site from stakeholders and other sources. This has informed the design brief, precinct planning and concept design. The flora and fauna site surveys revealed there are important species in the area including the Damp Heath Scrub, Estuarine Flats Grassland, Coast headland Scrub, Southern Brown Bandicoot, Swamp Antechinus, Broad Tooth Rat, Rufus Bristle Bird and the Swamp Skink. Appropriate measures will be undertaken to ensure minimal impacts occur to these species and their habitats through the construction and operation of the new bridge. Partnership with the Traditional Owners of the area, Eastern Maar, is ongoing to support the bridge design. A Cultural Heritage Management Plan assessment has recently been completed. It identifies the cultural heritage within the project area to be protected during construction and operation.